Purina® AMPLI-CALF® Program delivers 6,588 pounds more milk through first three lactations. A new study conducted at the Purina Animal Nutrition Center showed feeding calves a full potential nutrition program through six months of age resulted in as much as 6,588 pounds more milk through the first three lactations. This research builds on an earlier study showing calves fed the Purina® AMPLI-CALF® Program produced 2,740 pounds more milk in the first lactation compared to calves fed a conventional diet. The 6,588-pound milk production advantage can provide a significant boost to a dairy producer’s milk check. For every 100 milking cows, this could lead to more than $98,000 in additional milk income over three lactations (at $15.00/cwt). The benefits also extend beyond milk production. When paired with good management, the Purina® AMPLI-CALF® Program can reduce age at first calving to 22 months, on average.1 A lower age at first calving can provide more opportunities for voluntary culling and may help meet herd size and milk revenue goals with fewer animals. “A comprehensive nutrition program can ensure calves have the right amount of nutrients at every stage, setting them up for long-term performance,” says Dill. Dairy producers can capitalize on this new research by feeding Purina® Full Potential milk replacer at a rate of 2.5 pounds of dry matter per calf per day for the first eight weeks of life with free-choice AMPLI-CALF® 22% Starter. Continue feeding starter ad-lib through 12 weeks of age. Then, transition calves to AMPLI-CALF® Grower 18% at a rate of 10 pounds per head per day with free-choice hay. 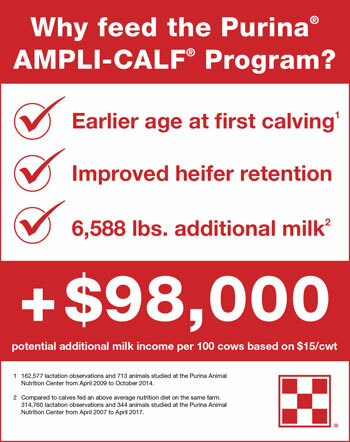 For more information on the Purina® AMPLI-CALF® Program, visit amplicalf.com. Sign up to receive Purina’s monthly HERDSMART® E-Newsletter by visiting purinaherdsmart.com . 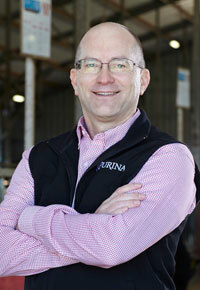 Purina Animal Nutrition LLC (purinamills.com) is a national organization serving producers, animal owners and their families through more than 4,700 local cooperatives, independent dealers and other large retailers throughout the United States. Driven to unlock the greatest potential in every animal, the company is an industry-leading innovator offering a valued portfolio of complete feeds, supplements, premixes, ingredients and specialty technologies for the livestock and lifestyle animal markets. Purina Animal Nutrition LLC is headquartered in Shoreview, Minn. and a wholly owned subsidiary of Land O’Lakes, Inc. Compared to calves fed an above average nutrition diet on the same farm. 314,760 lactation observations and 344 animals studied at the Purina Animal Nutrition Center from April 2007 to April 2017. 162,577 lactation observations and 713 animals studied at the Purina Animal Nutrition Center from April 2009 to October 2014.